Just because we haven't said anything for a while about our magic meat and cheese curing fridge, that doesn't mean there hasn't been anything going on. Quite the contrary, in fact. 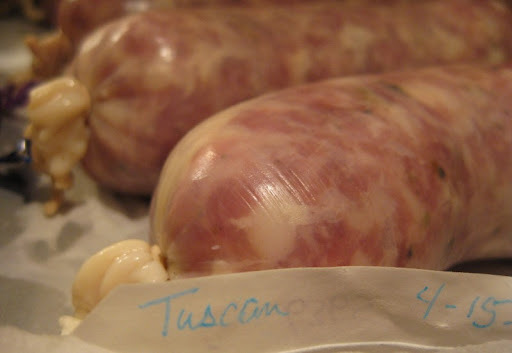 Case in point: our latest foray into the world of dry-cured sausages - Tuscan Salami. After having great success with Saucisson Sec, which is about the most basic cured sausage you can make, we decided to up the ante and do a fermented, cured sausage. Tuscan Salami seemed like a very good place to start. Like Saucisson Sec, it is made from simply seasoned pork - in this case with garlic, a touch of fennel and a bit of red wine (the recipe we used was from Charcuterie ). 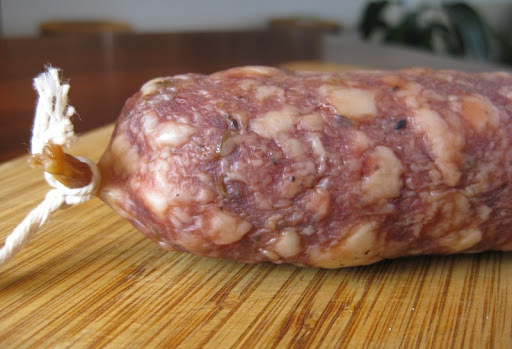 As I mentioned earlier, this is a fermented sausage. 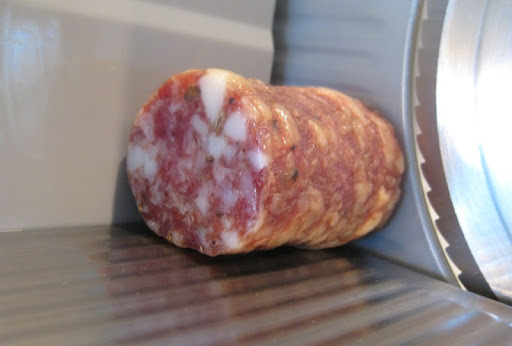 Fermentation adds that characteristic twangy bite that is prototypical of what I, as an American, think of as a "salami". The fermentation process starts by mixing sugars (dextrose and dry milk powder, which adds lactose) into the sausage meat base and then adding in a small amount of a beneficial live culture: Bactoferm F-RM-52. 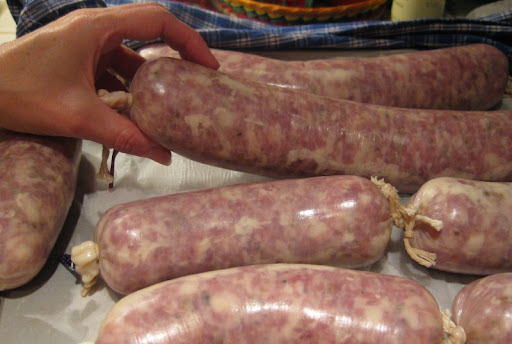 As counter-intuitive as it may seem, the resulting raw, stuffed sausages then rest for 12 hours at about 85ºF while the culture (the good bugs) eat the sugars and produce lactic acid. If all goes well, the pH decreases enough to turn the raw meat mixture into a decidedly unattractive place for any bad bugs out there (and adds that nice, tangy flavor as well - a very pleasant side effect). Afterward, the freshly fermented sausage doesn't really look any different, but it has most definitely changed. Fermentation is not the only new trick in our cured meat arsenal, however. We decided that we needed a slicer to do justice to the gems that our magic fridge has been turning out. After scouring Amazon reviews it was pretty easy to decided on the Chef's Choice 610 Premium Electric Food Slicer from EdgeCraft . Unless you are willing to spending the $500-$1000 it takes to get a commercial quality slicer, at $100 the Chef's Choice 610 seemed like the clear best bet. As one reviewer put it, "this is not a commercial machine but it thinks it is". So far, we've been extremely happy with it. It easily slices super-thin slices of salami (and cheese). Definitely the nicest cured sausage we've made so far (which is good, since we made a lot of it!). The thin slices our new slicer provides taste noticeably better than hand-cut. The skinnier slices are all surface area and make for rich, meaty, aromatic morsels. 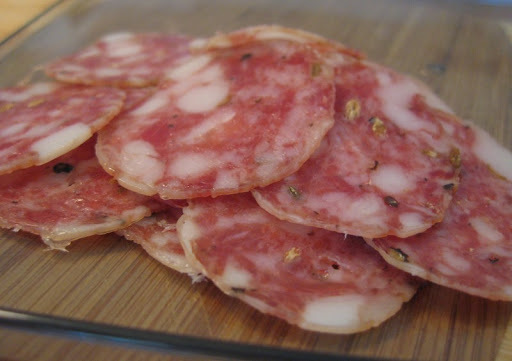 My mouth is watering looking at the beautiful, thin slices of salami. Is it time for prosciutto yet? Can the fridge handle that? And I love the slicer! Gadgets make me happy. Bravi! You guys are awesome. This looks very professional and very delicious. Thanks for the slicer recommendation also. Hi Leela - Thanks! 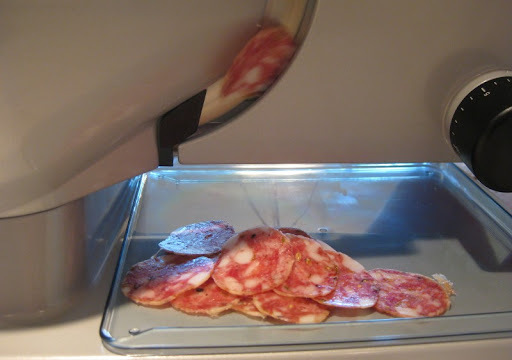 The slicer makes a real difference in the salami's taste - and I agree, the thin slices look much more professional too. Please tell, where did you get the beef middles? I got some a while back that were about a foot wide and smelled too bad for me to get near enough to use. We purchased ours from ButcherPacker.com. They are natural Beef middles -- the 50/55mm size. They were a little smelly, but a thorough soaking and rinsing solved the problem quite well. That looks great-where did you do the fermentation? Thanks so much Sherry. Can't wait. Your stuffing looks really good too. After the curing, the shape is still pretty nice. Mine shrivel so much more. I think I'll be trying those beef middles for saucisson sec. Looks like a nice diameter. 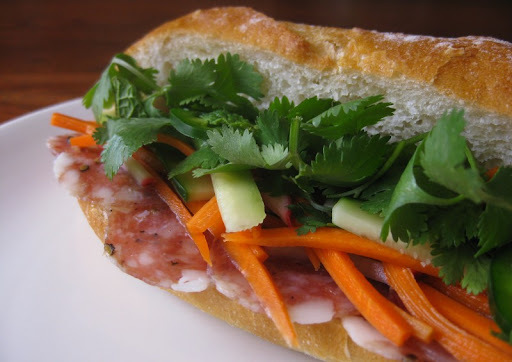 That looks soooo good I want some :P Im going to have to make a trip to Knight Salumi for a my fix now. You guys are killing me with the beer and Salami, two of my favorite things. Did you peel the casing off before eating? Are these narrow beef middles edible? Yes, we peel it off. The casing gets dry and tough and you wouldn't want to eat it.